In week 12 (16th – 10th March) the students of the Maritime Archaeology program partook on a survey week to learn more about different methods of recording. What was being recorded was the rudder that most probably belonged to the English ship of the line HMS St.George that went down on the west coast of Jutland in December 1811. When wrecked she was using an emergency rudder, because the original rudder, which we recorded, had been lost earlier. The rudder is now located at the Strandingsmuseum St.George in Thorsminde on the northwestern part of Jutland where many of the recovered artifacts from HMS St.George are on display. We used various recording tools such as photo documentation, sketching, and written descriptions of what we perceived. We also measured the rudder using a total station, where we measured angles and distances from the total station to the points that we survey. A total station is an electronic theodolite integrated with an electronic distance meter, which is also capable of storing data. To complete the numerous tasks we were divided in groups and subsequently changed around tasks to ensure that all had the opportunity to try out the various methods. It was important to get all of the recording completed precisely while we were at the site, so that it would be possible to do the post processing at a later time. The most time consuming part of the recording was the total station work, there were many many points which needed to be measured in; the outline of the whole rudder, the nails and nail holes, the different sheeting and different marks in the wood. The points we got from the total station we later processed using the software Rhinoceros 3D. 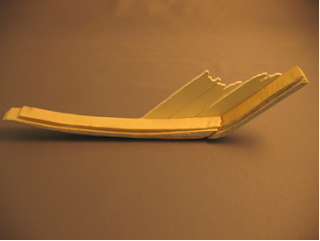 The processed results will offer us the opportunity to create a 3D model of the rudder. With the results of our recording the class will ultimately produce an article, which is intended for publication in The International Journal of Nautical Archaeology. We have now divided into different groups that will look closer at the description of this rudder, the methods that we have used to record it, and also look at shipbuilding, contemporary shipbuilding dictionaries and other rudders from the same period. Monday the 30th of March the Maritime Archaeology Programme commercial diving course went to Hemmoor in Northern Germany to spent a week diving in the famous Kreidesee. 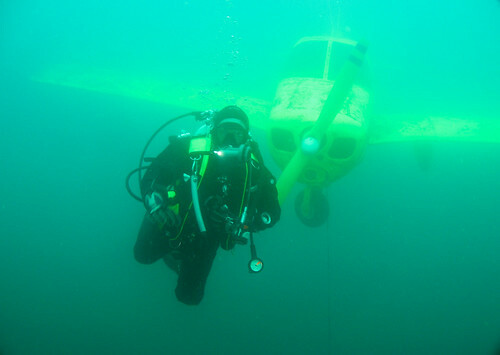 The Kreidesee is a flooded chalk quarry near Hamburg that was turned into a perfect dive site for divers at all levels. The visibility is fantastic, sometimes more than ten meters. 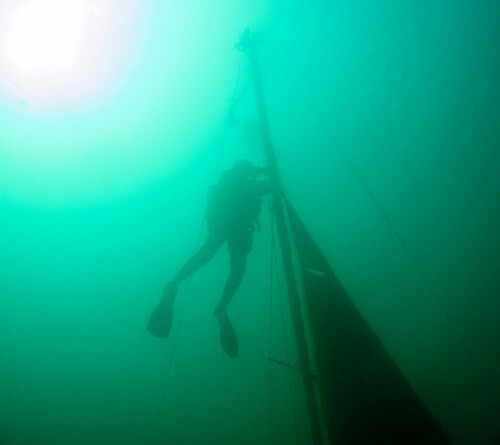 Besides gaining experience with dives to 30m, the week in Hemmoor also served as recording and navigation practice. Diving was either tethered using the Interspiro Divator full face mask, or untethered and on half masks. The “archaeological objects” to record with measured sketches and photographs included a sailing yacht with all sails set at a depth of 12m and an airplane with skeleton passenger (with sunglasses, submachine gun and suitcase full of money…). Getting the buoyancy right proved essential, as one fin kick at the wrong moment could leave everybody in the dark for minutes. One of the easier dives was sightseeing around the famous concrete Rüttler with a truck parked on top of it (no compasses involved…). Finally, the trip was rounded off by a visit to a unique “Greek – Indian” Restaurant with authentic music. Despite some small hiccups, such as wrong navigation (the Hemmoor Bermuda Triangle), slight buoyancy problems, constant entanglement and half of the team struck by the flue, etc. I think we all agree that our dive trip to Hemmoor was a fantastic experience that only increased our love for diving. In making the 1:20 model of the bow section of the Princess Channel Wreck we used many of the same procedures earlier mentioned. Since this part of the wreck had many heavy timber parts, it was natural to make some pieces in timber. The idea was that the model in this way would both be sturdier and get an improved appearance, than if constructed of cardboard alone. The only pieces made in cardboard were the strakes. Gluing 1mm and 2mm cardboard together gave us the general width needed to reconstruct the planks. The rest of the timber pieces; the keel, stem post, stemson and the frames were all made of wood. 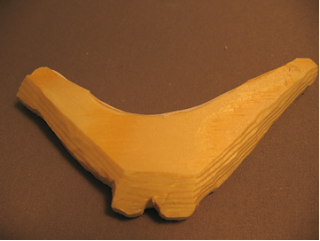 A 1:20 print was glued on to the moulded part of the wood and cut out using a jig-saw. The sided part was constructed in the same matter. Finishing touches and details, like rabbets and scarfs, were cut using a knife. 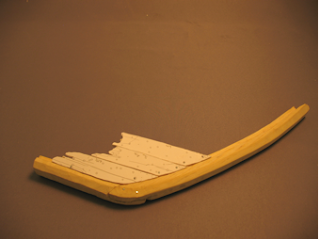 Since the wreck was not taken apart before recording, not all of the prints of the timber pieces had a full outline and some estimated guesses were needed also in order to calculate how the pieces were connected to one another. The Princess channel boat is believed to have been built frame first, so when putting the different parts together, we started with connecting the keel and stem post using small nails. For calculating the angle these should be situated, we used the outline of the stemson, which later was attached on top of the keel and stemson. Even though the original progress of building the ship started with the frames, we decided to begin with fastening some of the strakes. This was done to try to find the correct place to position the frames. After the lower strakes were attached, the frames were placed before the last strakes were fastened.